Imagine waking up in the trunk of a car and you’re all wet. As you wiggle around you realize that there is someone in there with you. Oh and you have no memory of how you got there…or even who you are. 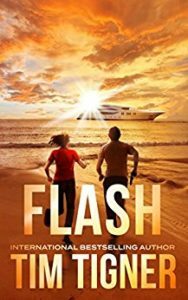 In Flash by Tim Tigner we meet Troy and Emmy, both are covered in blood, neither know how they got that way, and neither know who they are. Strangers facing are very frightening scenario together whether they like it or not. An interesting thriller as they race to avoid getting caught, figure out how they got this way, who did this to them and most of all who is trying to kill them. This article was published on Aug 11, 2018 . It is tagged flash, tim tigner. You can follow any responses to this article through the comment RSS feed.